1. Deseed and chop the jackfruit into pieces. Keep aside. 2. Soak the rice in water for 2-3 hrs and drain. 3. Take jackfruit pieces, soaked rice, grated coconut, salt and jaggery in a mixer/grinder and make smooth paste. Try to make the batter without adding water, if needed add only 2-3 tsp water. 4. Transfer into a bowl and add nutmeg powder, crushed peppercorn and cardamom powder. Mix well. 5. Heat oil in a frying pan. Take spoon full of batter and drop into hot oil. 6. Fry till golden brown. Remove from oil and place on a paper towel. 7. 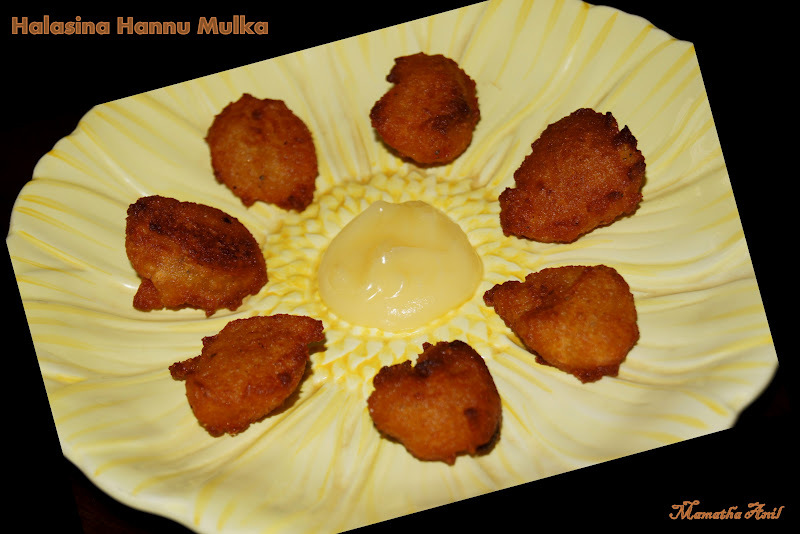 Serve Jackfruit mulka with Ghee. Jackfruit mulka is very tasty and one of my favorites too.